Home » Valentines Day Party!!! On Friday, February 13th TALK English Schools offered a fun-filled Valentine’s Day Party, full of games and surprises, including the selection of the Sweetest Hearts of our School. Students were able to interact with their groups and work as teams on the different contests. Throughout the year, there are many special traditional American holidays, when friends and family come together to celebrate the occasion and re-affirm their history, their values and beliefs. For any TALK international students who want to participate in these very American celebrations, St Valentine’s Day is a holiday that really matters! Valentine’s Day was brought to North America in the 19th century by British settlers. The first mass-produced Valentine’s Day card was printed shortly after 1847. In the second half of the 20th century, the practice of giving gifts along with cards became popular. Roses and chocolates were the most commonly exchanged Valentine’s Day Gifts and were usually given by man to the woman. Around 1980’s the diamond industry began to promote Valentine’s Day as an occasion to gift fine jewelry. Valentine’s Day is the major card and gift giving festival in USA. Weeks before this holiday, stores and restaurants launch major marketing campaigns, hoping to lure consumers. Popular gifts exchanged on the day include cards, fresh flower, mostly roses – and chocolates. Valentine’s Day dates and parties are organized ato celebrate the occasion. 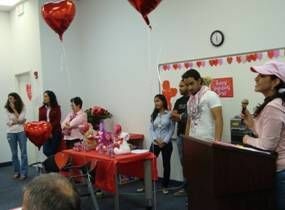 Even schools organize Valentine’s Day programs and fun, where children perform songs, dance, skits and plays. Children also make handmade gifts and cards to give to their friends and teachers. If your loved one is far away, Valentine’s Day greetings are exchanged with the help of e-cards and by sending gifts through online Valentines Day gift shopping sites.